Terrible night frost in late April 2017 devastates the blackcurrant farmers’ hope for a good yield. What had looked very promising until mid-April turned into a nightmare for many blackcurrant growers all over Western Europe. The first months of the year had been like every year and weather conditions were good. Two weeks of sunshine and warmth in early April brought the blackcurrants to lovely blooming. 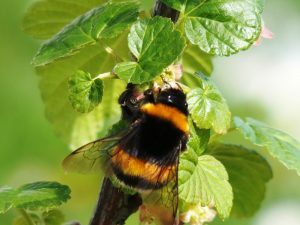 The bumblebees did their work like usual, humming had been all around, and the growers were happy with a low level of diseases and pests. But around Easter, the situation changed totally: from 25°C in daytime, the temperatures dropped to 10°C. And then – the meteorological forecasts announced night frost! 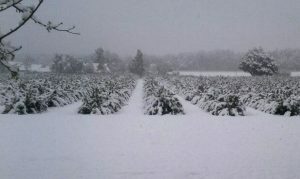 When Michael Bullinger from Germany inspected his Tisel fields just before the frost, the plants were in full blossom. But it was already clear that with temperatures like -8°C announced for the coming night, none of the bushes would bring any currants. His yield 2017 may not be existing – but he has still hope for a few varieties like Ben Alder and Ben Hope, which had not been blossoming yet. And luckily, temperatures are increasing slowly. This picture has been taken by Daniel Pröbstle from Günzburg in Bavaria (Germany): a blooming blackcurrant field covered with snow! One can easily understand what this means for this year’s yield. Other German growers who were less affected still talk about at least 50% loss. Growers from France said that varieties like Blackdown in Burgundy had already finished blossoming, and currants are growing on the bushes. But other varieties had just started blossoming. And quite logically, the further North we go, the more effects the frost has had in the blackcurrant fields. 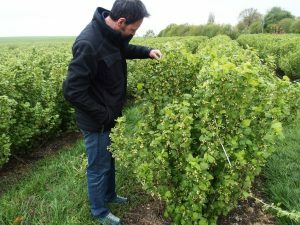 For France, this is already the second year of strongly reduced yields because of night frost in April – unprecedented conditions, which push certain farmers to stop growing blackcurrants. Poland reports similar conditions: from 16th April onward, temperatures were below zero; in some regions even below -6°C. Frost losses are already visible, although it is difficult to estimate them precisely today. In any case, as Poland is the World’s biggest blackcurrant producer, the damages will have consequences. Of course, what can be observed everywhere must be assessed locally: the effects of the frost first depend on the blackcurrant varieties. It can also change from one grower to the other within the same country, and even within the same region. As a conclusion, we can already foresee that the 2017 harvest will not be memorable in terms of quantity. And according to what we are already being told from climate specialists, we will have to expect more and more extreme weather events of the same kind. They will certainly impact all of our growers in the near future. Spring frost, drought, no frost in winter (although blackcurrants need it), hail and many more surprises of this kind can destroy plantations and reduce the harvests. Global warming is a vast subject, but it is clear that it effects our ecosystem – and blackcurrants are part of it.